Bottling the community wine at the Hawkwood Winery. Do you grow grapes in your garden or allotment that you would like to have made into a clean and pleasant tasting wine? If so, then community food co-operative Organiclea is inviting you to deliver your harvested grapes to its Hawkwood Winery in North London this autumn. The Winery will combine all deliveries into two batches to make red and white wine, and will then return the finished wine to participating growers in the proportion of grapes they deliver to this year’s vintage. The minimum individual delivery the winery will accept is one full bucket of ripe, clean grapes. You can expect to get one bottle of red wine for every 1.5 kilos of grapes and a bottle of white wine for every 2 kilos. In return for your grapes and a minimal production fee of £6 per bottle, Hawkwood Winery will ferment, age and bottle the wine, releasing it to you in September 2016. Your wine you will be for domestic consumption only – that is, it cannot be sold. The days on which the grapes can be delivered to the winery will be announced at the beginning of September, and will depend on how grapes are ripening across London in this particular year. Participants in the wine making scheme will be informed in good time to allow them to harvest and deliver their grapes to the winery. To join the scheme please contact Marko Bojcun at communitywine.gmail.com with the following information: your post code, the expected weight or volume of your harvest, the grape variety, if known, and whether you treat your vines with any sprays. The wine made from the 2013 harvest of participating London growers goes into bottle at the Hawkwood Winery. Do you grow grapes in your garden or allotment that you would like to have made into a clean and pleasant tasting wine? If so, then community food co-operative Organiclea is inviting you to deliver your harvested grapes to its Hawkwood Winery in North London this autumn. The Winery will combine all deliveries into two batches to make red and white wine, and will then return the finished wine to participating growers in the proportion of grapes they deliver to this year’s vintage. The minimum individual delivery the winery will accept is one full bucket of ripe, clean grapes. You can expect to get one bottle of wine for every 1.5 kilos of grapes. In return for your grapes and a minimal production fee of £6 per bottle, Hawkwood Winery will ferment, age and bottle the wine, releasing it to you in September 2015. Your wine you will be for domestic consumption only – that is, it cannot be sold. Last autumn when it was first launched, the Community Wine Making Scheme took in 500 kilos of grapes from 39 households across London, which were made into 375 bottles of wine. In January the participating growers were invited to the Hawkoood Winery to taste the young wine from the cask. 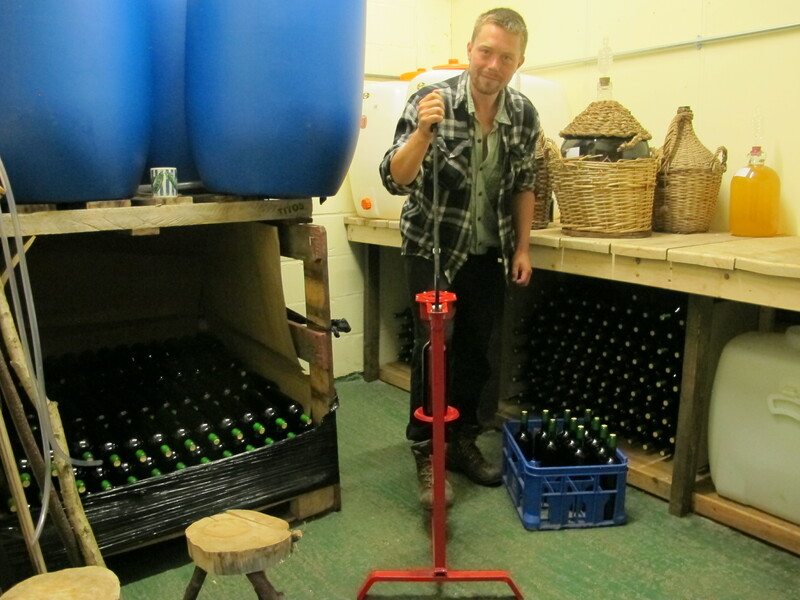 The 2013 vintage is now in bottle and ready to be distributed to the scheme’s participants. The day on which the grapes are to be delivered to the winery will be announced at the beginning of September, and will depend on how grapes are ripening across London in this particular year. Participants in the wine making scheme will be informed in good time to allow them to harvest and deliver their grapes to the winery. To join the scheme please contact Marko Bojcun: mbojcun@yahoo.com – with the following information: your post code, the expected weight or volume of your harvest, the grape variety, if known, and whether you treat your vines with any sprays. The Hawkwood vineyard at Organiclea’s growing site in Chingford is near the bottom of a large hill covered in trees. We are on the western perimeter of Epping Forest. The hill above us catches the westerly wind and collects the rainfall throughout the winter and then releases it from around January each year. That is when two springs rise out of the high end of the vineyard and start sending lots of water out over an already soaked ground. The bottom of the vineyard becomes the worst affected area: a heavy clay-loam soil that remains waterlogged well after the buds have burst on the vines. And so the vines, coming now into their fifth season, are not thriving. We began tackling this problem over the past winter. First, we dug a French drain (for illustrations: https://www.google.co.uk/?gfe_rd=cr&ei=DrBCU–tO4rY8geQw4GYCw#q=french+drain+diagram) Starting it from the two springs, then down between two rows of vines and right out of the vineyard. The effect was immediate. I estimated about five litres of water per minute were flowing out of the vineyard at the peak of the springs’ emissions in February. The stream that previously ran downhill and spread out over the vineyard floor stopped flowing altogether. Instead, the water coursed sideways through the drain and into the forest. 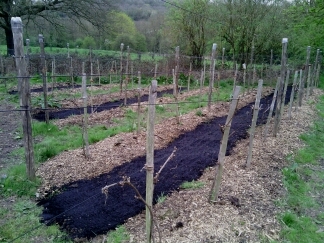 Second, we mulched the vines, starting from the bottom of the vineyard. The layers, in order of laying them down, were: 10cm thick compost (from grass cuttings, some leaf mould, weeds and vegetable peels); cardboard and 5cm of woodchips. The mulching covered 90cm of ground directly under the vines. Its purpose is to attract more worms and microbial life around the vines’ roots, protect the vines from competition of other plants in their immediate vicinity, and to raise the contour of the earth at least a tiny bit along the rows. 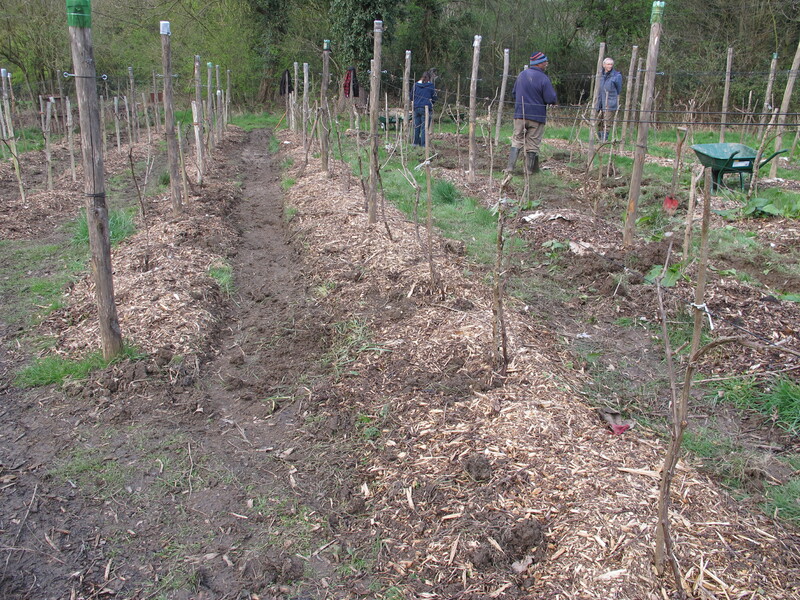 By the end of March we managed to mulch the bottom twelve rows, out of a total of thirty. Third, working in every second row, we lifted the turf from the remaining 90cm of ground between the mulched rows (they are 1.8m apart) and stacked it up to decompose back into fine earth. Then we dug over the bared earth to a depth of 10cm, broke it up as best we could, and covered it with a thin 2.5cm layer of fine black compost. These tilled strips we then seeded with a mixture of alfalfa, red clover, white clover, sweet clover and chicory. These plants send down long fibrous roots that break up the heavy soil, admit more air and improve transpiration of the soil. All such changes should improve the conditions of life for all species living in this kind of heavy soil. By the end of April we will treat in this way every second row up to the twelfth. We plan to work our way up the hill right through the vineyard over three growing seasons, eventually mulching under every row of vines and planting a new cover crop down every second row between the mulched vines. That way we will still be able to reach and tend every vine from a row that hasn’t been planted with the cover crop. We won’t walk on the cover crop at all in its first year. After we’ve done all that, we will go back to the bottom of the vineyard, plant a new cover crop down the rows we have been tending the vines from, and start tending the vines instead from the rows on which we started planting cover crops this past winter. That way, at any one time, half of the vineyard floor will resting from human footfall, except for the occasional pass of the lawn mower down rows of well established cover crop. That’s the plan, and in it lies the hope that our vines will be happier growing in a livelier, looser, warmer soil. Spring seems to be coming early this year. Budburst is practically upon us. So we’ll see soon enough how the vines respond to their changing environment. 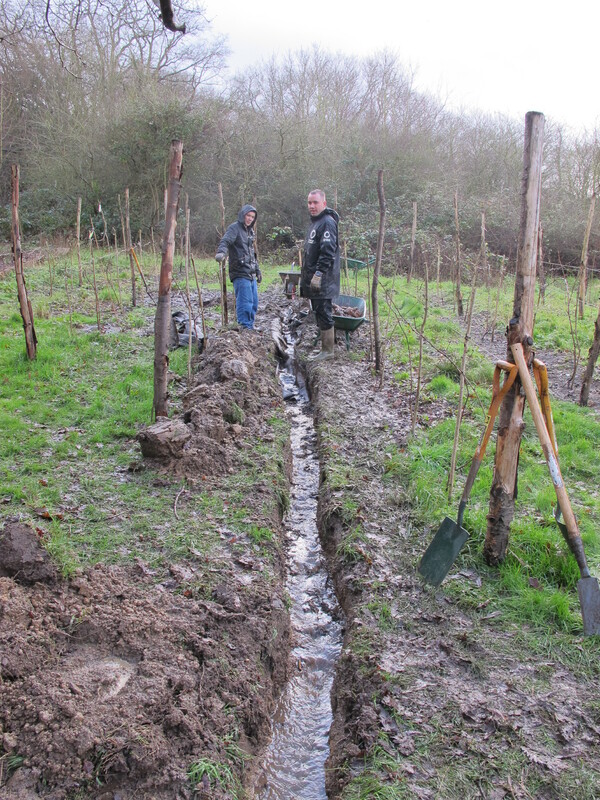 There is a small vineyard tucked in under the edge of Epping Forest, planted in stages since the winter of 2010-11 by members of the Organiclea co-operative and a team of volunteers. The first planted block of vines were expected to produce a modest crop in 2013. As the first season approached when we would not pinch out the embryonic grape clusters any more, but let them grow into ripe fruit, our attention turned to the issue of controlling possible outbreaks of disease. With my allotment vines I have for years relied on the following strategy: regular leaf plucking to keep the vines well exposed to air flow and light penetration; sacrificing whole areas of foliage and fruit surrounding an actual outbreak if it manages to spread over a vine; and as a last resort spraying all the vines with sulphur. Over time I’ve managed to reduce my reliance on sulphur to three sprays in a season. In 2013 my approach to combating disease evolved a step further, beyond canopy management and sulphur sprays to the application of biodynamic sprays. Basically these are infusions of several different plants that have been prepared and applied onto the vines and the ground around them according to biodynamic principles and practices. The basic approach is preventative: to strengthen the vine against disease rather than having to combat an actual outbreak already afflicting it. Three good books to consult are: Maria Thun, The Biodynamic Year (Temple Lodge, 2010); Pierre Masson, A Biodynamic Manual; translated by Monique Blais (Floris Books, 2011) and Francois Bouchet, Biodynamic Agriculture: how to apply it in the vineyard; translated by Jacqueline Bouchet (Deux versants, 2008). Our main concern in the Hawkwood vineyard with respect to disease has been the possible outbreak of powdery mildew and downy mildew on the vinifera vines Madeleine Angevine and Pinot Noir. We are not concerned about our Regent vines, officially classified as vinifera, but in fact with some Chambourcin ancestry that makes them disease resistant. From experience on other growing sites we know that one of our vines, of still unknown provenance, (we call it Hoxton Hungarian) is also disease resistant. Therefore we anticipated possible trouble with the known true viniferas, which total 167 vines out of 430 and are located right in the middle of the vineyard with hybrids on either side. In addition to weekly management of the leaf canopy, we decided to spray the vines only with biodynamic preparations during the 2013 growing season, and to hold sulphur in reserve in case we had an uncontrollable outbreak of disease. We had permission from the Soil Association to use sulphur up to three times to combat an outbreak. However, we did not use sulphur at all, although we should have (see below). 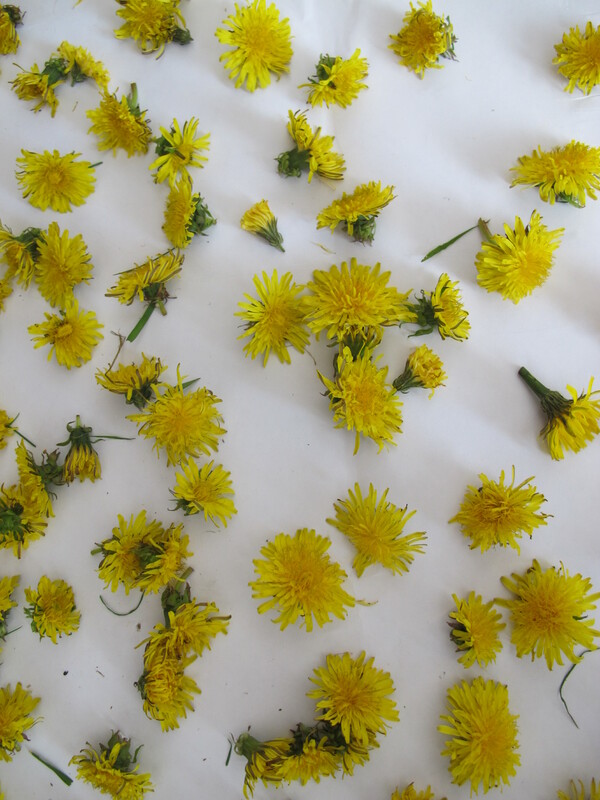 All of the ingredients were sourced on the Hawkwood site, except for the dandelion flowers which were picked on the Hackney Marsh. Each spray was prepared by steeping the fresh or dried ingredients in just boiled water for up to three hours, diluting the infusion 9 to 1 with rainwater, stirring for one hour and spraying over the vines and/or the ground either in the morning or the afternoon, depending on the effect desired. Spraying days were chosen with an eye on the weather and the phase of moon (three times we did it around a perigee full moon). On 16 August we found a powdery mildew outbreak in the vine nursery bed at the eastern end of the vineyard. The nursery bed had not been sprayed at all, an oversight. We removed the affected leaves and the outbreak was thus suppressed. All the vines in the vineyard stayed healthy and clean until mid September, when it became warm and misty in the mornings. It was then we had an outbreak of downy mildew on the underside of the leaves of the Pinot Noir and Madeleine Angevine vines. We did not deal with this outbreak in any way as it spread because we weren’t sure what it was until the damage was fully done. By the beginning of October all the leaves of both vines were falling off. 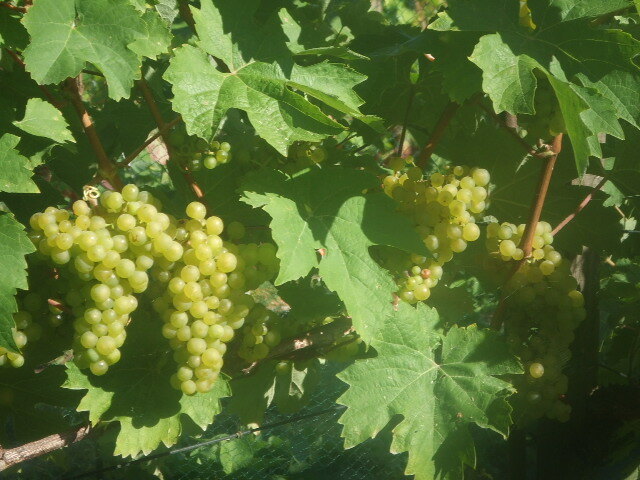 However, the Madeleine Angevine grapes had already ripened. On the other hand, the Pinot Noir had not ripened by then, so the loss of leaves meant that its grapes never ripened. 1. We stopped our spraying programme too soon in the season. We should maintain a regular spraying programme with the biodynamic preparations right through past veraison until the grapes are approaching full ripeness. 2. We should spray all the vines, including those in nursery beds, and the perimeter of the vineyard. 3. We have learned what downy mildew looks like and how rapidly it spreads. We should pinch out the affected leaves as soon as we notice hem and, failing that, spray with sulphur to suppress the outbreak. 4. Past a certain point the loss of leaves from the vine slows down and then stops ripening altogether. Therefore it is mistaken to expect that ripening will outrun a disease outbreak at the end of the season, especially on late ripening varieties like the Pinto Noir. I ran exactly the same spraying programme on my allotment vineyard in Hackney and had outbreaks of bunch rot on the Madeleine Angevine and downy mildew on the Kubishevksy vines. This was the first time I’d seen downy mildew on the allotment, but I didn’t recognise it in time. It went all over the grapes, so I had to cut away the biggest crop of Kubishevsky I’d ever had and let the fruit decay back into the soil. As for the rot on the Mad Ange, I learned that you can’t control its spread simply by removing affected berries or even whole bunches. Once its present on the vines its time to harvest the grapes within 24 hours. This one day course will look at everything to do with growing grape vines. It is particularly suited to small scale urban growers. No previous experience is needed to join in. The course will be based at Organiclea’s Hawkwood growing site, and will involve practical work and demonstrations in the vineyard. We will practice winter pruning on the vines that are growing here. The classroom-based sessions will include the following topics: annual growth cycle of the grape vine; the annual calendar of work with the grape vine from infancy to maturity; use and care of tools; propagating, planting and replanting vines. 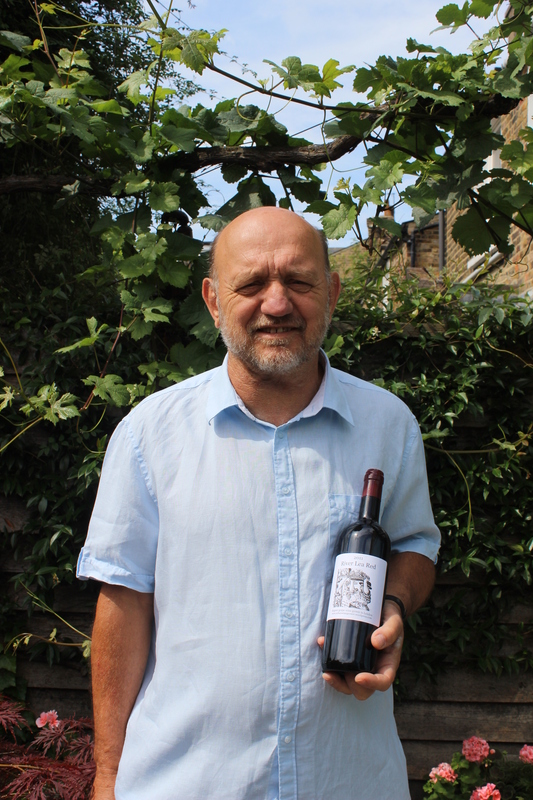 The course is led by Marko Bojcun who has been growing vines and making wine in Northeast London for over 20 years. He is an experienced tutor and member of Organiclea. Do you grow grapes in your garden or allotment that you would like to have made into a clean and pleasant tasting wine? If so, then local community food co-operative Organiclea is inviting you to bring your harvested grapes to its Hawkwood Winery this autumn. The Hawkwood Winery is the first in London since the Middle Ages. It has been built to produce wine from Organiclea’s vineyard on site and on behalf of other small scale growers. The Hawkwood Winery will accept grapes from households, put them together into two separate batches to make red and white wine, and then return the finished wine to the participating households in the proportion of grapes they have delivered to this year’s vintage. The minimum individual delivery that the winery will accept is 7 kilos/15 pounds, or one full bucket of ripe, clean grapes. You can expect to get five bottles of wine from 7 kilos of grapes. The amount of wine you receive will be proportionate to the weight of grapes you contribute. The day on which the grapes are to be delivered to the winery will be decided at the beginning of September, and will depend on how grapes are ripening across London in this particular year. It will most likely be either Saturday 21 September or Sunday 29 September. Participants in the wine making scheme will be informed in good time of the set date. In return for your grapes and a minimal production fee of £5 per bottle, Hawkwood Winery will ferment, clarify, age and stabilise the wine, releasing it to you in bottles with labels by September 2014. Half the production fee will be payable when you deliver your grapes, the other half when you collect your wine. Your wine you will be for domestic consumption only – that is, it cannot be sold. To join this scheme please email Marko Bojcun, Organiclea’s grape grower and wine maker: mbojcun@yahoo.com – with the following information: your post code, the expected weight or volume of your harvest, the grape variety, if known, and whether you treat your vines with any sprays. To be held on Sunday 27 January 2013, 9.30am-4pm at Organiclea’s Hawkwood Plant Nursery in Chingford. This one day course will look at everything to do with growing grape vines, from their planting, and growth training, propagating new plants and specific pruning essentials. There will be practical work and demonstrations in the newly established vineyard as well as classroom-based sessions on the following topics: annual growth cycle of the grape vine; tool use; propagating, planting and replanting vines; working with vines from their infancy to maturity; annual calendar of work with the grape vine. The course is led by Marko Bojcun who has been growing vines and making wine in London for over 20 years. He is an experienced tutor and member of Organiclea. Whether you rely on your grapes’ own yeast to start fermentation or you introduce a cultured, store-bought yeast to the must there are times when the fermentation just won’t start. That was just one of my problems to deal with this year. The growing season this year in London was wet and cold until the end of July, fruit set was poor and we only had good weather at the very end of summer. My harvest was small, but for that reason it was comparatively ripe – 17-18 percent sugar in the Regent and Madeleine Angevine grapes. So come the autumn equinox on a beautiful sunny Saturday, I went up to the allotment and harvested the grapes, brought them home and held them overnight in covered pails outside. That, probably, was the first mistake – to let them cool down again, because the weather that night turned cold and wet again. On Sunday I trampled the grapes, brought them inside and waited for the little bubbles to rise. Nothing….I had prepared separate fermentation starter batches the week before for the white and the red wine (on how to do it, see my blog for 5 September 2010: Starting Fermentation before harvest), but even these selected ripe grapes didn’t want to start fermenting for the whole week leading up to harvest. What could be the problem? Possibly, the poor growing season and especially the persistent rain has weakened the yeast colony living on the vines. The Madeleine Angevine in particular didn’t seem to have any of the characteristic white bloom on the skins when I harvested them. They were all shiny and translucent. The other, and more likely, reason, why fermentation wouldn’t start was the cold weather that set in right after the harvest. Yeast needs two things above all to start multiplying and fermenting the sugar in the must: oxygen and heat. Once fermentation reaches a critical mass it generates enough heat of its own accord, and can even overheat. Much like a nuclear reactor. The oxygen, too, is spontaneously mixed into the must by the bursting of many CO2 bubbles on the surface. But if the temperature of the must stays low and the surface still the yeast will simply lie dormant. And there’s a danger that, the longer it stays that way, some other airborne bacteria will turn the must into an altogether unwanted direction of decay. Solution? My first response was to take a large stainless steel pot from the kitchen, fill it up with as much juice and skins as possible and put in on a gentle heat over the stove. Stirring constantly I let the batch warm up to just past human body temperature (about 40 degrees celsius). Then I poured the warmed up contents back into the pail with the rest of the must, stirred vigorously and covered the pail again with a cloth. 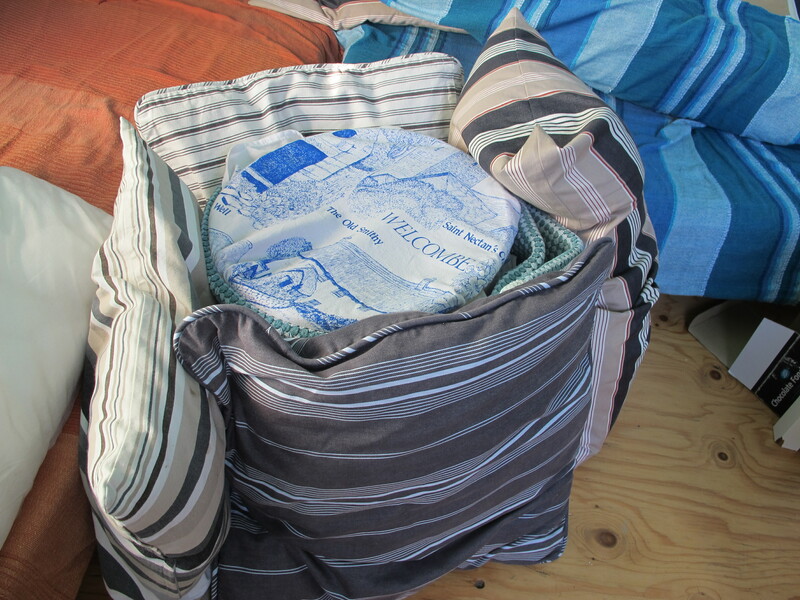 In the case of the smaller batch of Madeleine Angevine held in the pail, I put it to bed for the night by wrapping it in a rug and surrounding it completely with cushions. The next morning it was fermenting happily away! In the case of the bigger batch held in a plastic barrel, I waited till the morning to see if its contents – the Regent grapes – would start fermenting. They hadn’t, so after removing, heating and then returning a good portion of it to the barrel, I pulled the barrel over to the fire to stay warm for a few hours. Still nothing…for another twenty-four hours. 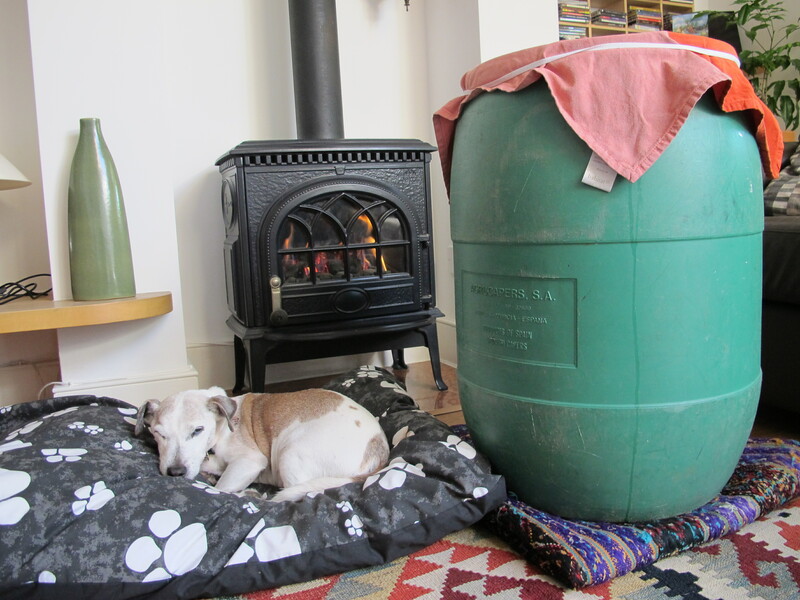 The barrel was too large to wrap up (I did consider the electric blanket in our bed, but that course of action may have provoked an outcry from my partner). And as the actual red grape must occupied only a quarter of the barrel, it also had a large surface area relative to its volume from which to lose its heat. So I emptied the must from the barrel into two pails, which filled them completely, wrapped them up like I had the white wine must, and in twelve hours time they were bubbling away, too. So, I retain my faith in the grapes’ own yeast. And I am reminded once again to ferment the must in filled upright containers, to keep the containers warm, to cover them securely to keep the fruit flies out, and to plunge the cap at least every eight hours. One of the biggest challenges facing urban wine growers is the fact that the sun doesn’t always shine directly onto ground suitable for growing vines. People may have a patch of land to plant in, but often it is overshadowed by a wall or a building . Or they may have a balcony or a roof terrace well exposed to the sun, but grape vines don’t grow well in pots. On the other hand, they could plant a vine in the ground with the intention to train it up the wall onto the balcony or roof terrace where the sun does shine. At our northern latitude the vine will struggle through the shade to gain height and reach the sun. It may succeed, but it will take years. Here is an experimental design that may help overcome this problem. Basically, it’s a grow tube propagator made up of two parts: an earth filled steel pipe placed vertically onto the ground, on top of which a solar tube is fixed to make a single column. The column is attached to the wall of a building using metal straps or other suitable fixings. Both parts of the column are between 30 and 40 cms in diameter. The entire length of the propagator column can vary, as can the length of each part. In the diagram reproduced here I have shown a propagator approximately 8 metres long, with each part – the solar tube and the earth filled steel pipe – 4 metres long. At 8 metres it is designed to reach the roof of a typical two storey terraced house in London. Where the vertical distance to be spanned is short, one could rely solely on a solar tube placed directly on the ground over the planted vine. However, where the distance is much greater, one needs to raise the earth up through a steel pipe while bringing the light down through a solar tube. I think this experimental design shows promise because it suits the growth habits of the grape vine. First, one can quite easily grow a cane four metres in length on a mature grape vine. I’ve done it with a Pinot Noir in my backyard. Second, given an optimal growing environment, all of the nodes of a planted cutting will either send out roots if they are in the ground or leaves if they are above ground. In other words, the vine uses every part of its original length to get started. 1. Plan the timing of the entire job around the pruning of a suitable cane in late winter and then planting it into the propagator within hours of pruning. 2. Dig over the bed chosen for the vine, ameliorate if necessary to ensure adequate nutrition, good drainage and maximum room for roots to strike. 3. Measure the built structure alongside the bed and check that it is suitable for supporting the assembled propagator. 4. Prepare all the necessary parts of the propagator: steel pipe with base rods welded on for locating the pipe on the bed , solar tube; suitable join between pipe and tube; metal straps or other fixings that can support the final weight of the column ; and a stake to insert alongside the vine. 5. Locate the steel pipe and fix it with its straps to the built structure alongside. The pipe should be embedded partially into the ground, but its weight and the earth that will be poured into it should be supported almost entirely by the straps, not by the ground below. 5. Insert the vine cutting down the centre of the pipe to the ground, backfill with earth to nearly the top of the pipe. Leave the top of the cutting with two to three nodes protruding above the earth. 6. Drive in the stake right alongside the protruding tip of the vine cutting. 7. Water the vine cutting in the pipe over two or three days, until water is seen to drain out into the ground. 8. Attach the solar tube to the steel pipe with a join suitable for detachment later, and fix it to the structure alongside with straps. 9. It may be necessary to detach the solar tube and reposition the growing shoot if it turns downwards, or if the density of growth blocks the tube. The objective is to encourage the strongest growing shoot to rise up out of the top of the solar tube. In the event this takes more than one growing season, it may be necessary to get to the vine along its growing length and to prune it after leaf fall for the next season’s growth. Basically this task will require removing all but the strongest growing cane and then cutting this cane back to ripe wood. 10. Once the vine has cleared the top of the structure and it has ripened its wood well into the autumn, the solar tube should be detached from the pipe and carefully removed up over the head of the vine. The vine remains in the steel pipe growing down into the ground. Its growing tip is fixed and trained onto a suitable trellis on the roof or balcony. A note of caution: this is an experimental design. I have not yet tried it. And I am not a structural engineer, so I cannot vouch for the physical adequacy of the propagator’s components and their assembly. One concern I have is about the load the propagator column will exert on the vertical structure to which it is attached and the kind of metal straps or fixings capable of tying the column and structure together. One could reduce the load on the structure alongside the column by securing a flange around the base of the steel pipe so as to spread the load out over the ground. 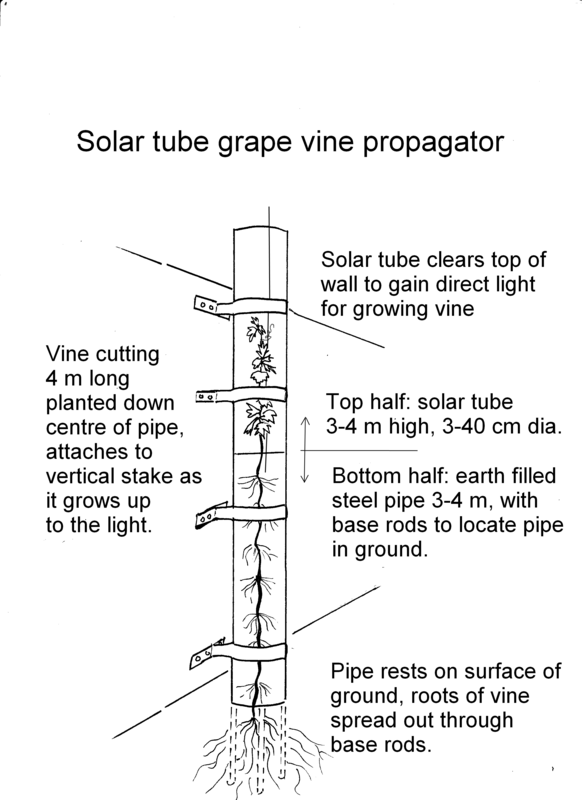 This addition would be acceptable for so long as the load bearing down on the ground is not so great as to unduly compact it and prevent the vine roots from striking..
As an experienced vine grower I am reasonably confident that a freshly pruned and ripe vine cutting in this propagator will send out roots at numerous points inside the pipe all the way to the ground. And the solar tube will bring sufficient light down to the buds on exposed part of the cutting to get them to burst open into leaf. As long as the propagating is done in the late winter-early spring, I think the cutting will root successfully and grow away vigorously. And once it emerges through the top of the solar tube into direct sunlight, it will grow and fruit just like any grape vine. 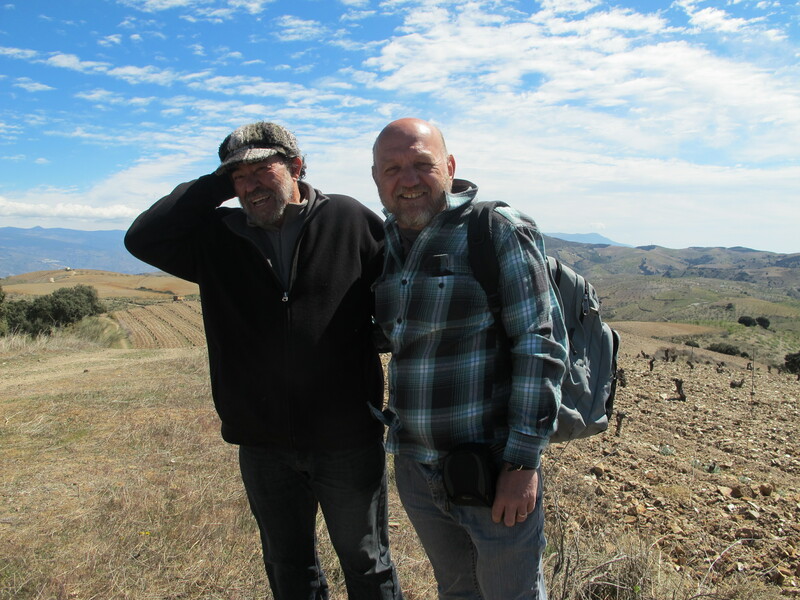 Right after Easter I led our party of six travellers eastwards through the Alpujarras mountains in southern Spain to the vineyard of Manuel Valenzuela. 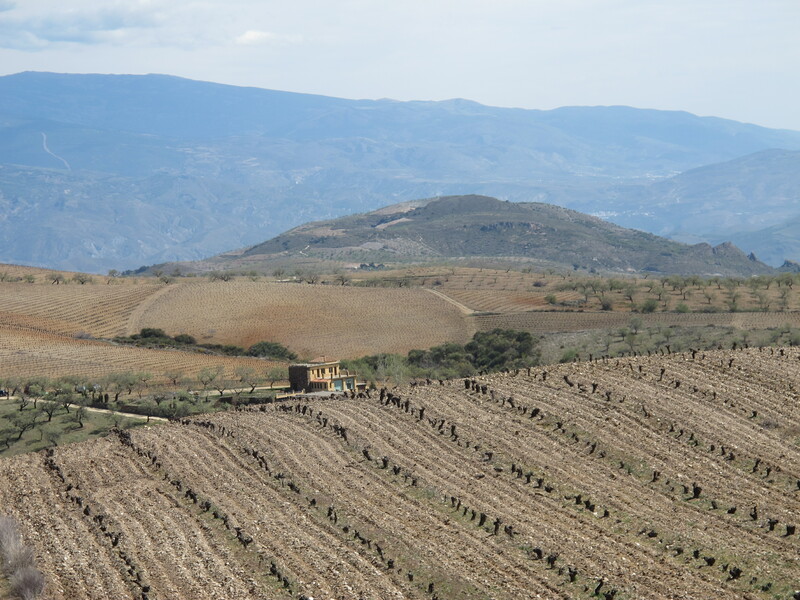 Cortijo Barranco Oscuro is located in the district of Costa-Albondon, a few kilometres north of Cadiar. The wines are known by their trademark Barranco Oscuro (The Dark Ravine). Manuel is the grower in these parts who first dared to plant his vines at an altitude where others believed they could not survive. On our first visit to his vineyard two years ago he told us about the advantages of this altitude – the greater intensity of the ultraviolet light, the cold nights in summer, the purity of the air and of the soil, the absence of fungal and insect predators that confront the grower at lower altitudes. Such conditions have also allowed Manuel to grow grapes and make wine without using sulphur or any other chemicals. He first took us to the highest point of his vineyard – 1368 metres above sea level. To the north snowy Mulhacen towers against the blue sky and to the south the blue Mediterranean stretches out to Africa. From here one can see Morocco on a clear day. Long dotted rows of black vine trunks run out over the hills. The ground is stony and lean, tilled into closely spaced furrows to catch the infrequent rain. They are bush vines – low gnarled stumps, each with just a few spurs of last year’s wood, each spur carrying one bud for the new season’s growth. The buds are still hidden deep in the wood. That’s not unusual so high up in the mountains at this time of the year. Yet this season there are two additional factors dissuading the buds from swelling and breaking open into leaf. First, Manuel tells us that there has been practically no rain up here since last October, so there is less than half of the usual precipitation stored in the ground. And second, there is a fierce wind blowing up over the Contraviesa, the tier of mountains running between the coast and the Ulpujarras. The wind is an enemy of the vines and so they hug the ground and will wait until it passes before the new growth peeps out. Here in the photograph you can see Manuel and me braving the wind on the hill. This is a demanding terrain for growing wine. In a good year Manuel will harvest about 700 gm of fruit from each bush vine, not enough for a bottle of wine. On the trellised vines he will get more. This year, however, he is expecting far less from them because of the drought. The vines will survive, for sure, but the harvest will be very small, if at all on some of these exposed slopes. However, a great wine comes invariably from the vine that must struggle against adversity. Manuel’s wines are known as vinos de altura – which in Spanish means both wines of altitude and wines of depth. So we move on back down the hill to the homestead and the winery. We are driven underground by the raging wind. A tour through the cool vaulted cellars, past the champagne bottle racks, the steel tanks and the barrels of French and Slovenian oak, and we rise up again into a peaceful, big bright room with stained glass windows and dark wood tables and benches – the tasting room. Manuel pours out a dozen wines, each one introduced by animated description of the wine making process and the secrets revealed. Sarah, our best Spanish speaker translates for us all. Jane and Sean and Sue drink all that’s given. Mike and I, the drivers in our group, drink deeply of the scent and aroma, we taste but do not swallow. Brut Nature: aka champagne, clean, sharp, dry but fulsome. Unavailable unless one orders first directly from the vineyard. Manuel describes a method of making this wine that I understood enough to realise that it’s not manufactured like the French stuff, but involves a refermentation relying on the next season’s grape skins. Must go back again to learn more. Blancas Nobles Classico 2009. Rich, aromatic and fresh. Vino Costa. Homage to the traditional wine made in the Contraviesa. If you’ve drank costa in the bars around here, this is the clean and unoxidized version. Same pale colour. Made from Palomino Negra and a little Garnacha. Great traditional label. Garnata 2009. From Grenache. Lovely garnet wine. Rubaiyat 2005 (yes, of Omar Khayyam -a poem is quoted on the bottle). Made from Syrah. A big wine, yet restrained, that comes forward slowly. Tempranillo y mas 2006. More than 50% Tempranillo and three other black grapes. Complicated, molasses, still dry on the tongue. A meditation wine for me. Borgognon Granata 2006. Made from Pinot Noir. This Pinot you’ll recognise as an exotic long lost cousin. 1368. Vintage year 2004. For its age, it tastes surprisingly fresh. I can smell that wind in it. Xarab. Half bottle of golden dessert wine. If you like your pudding, this one adds fresh fruit to it. On a par with a fine Tokaji. At the end of our stay, everyone had a big hug with Manuel. And on we went north into the Alpujarras to find the ancient village of Yegen, where the writer and Hispanicist Gerald Brenan went to live after the First World War (as told in his book South from Granada). There, by chance, we came upon an Irish woman who owns a restaurant and bar on the main road, right next to a little museum created in Brenan’s honour. She opened up the museum for us and we viewed the paintings and photographs, the rooms of the house, the view over Yegen from its windows. When we returned to the woman’s bar (I regret not asking her name), I told her where we’d been that day. To which she pulled out a bottle of 1368 from the wine rack and said “Oh, I know Manuel, he’s a friend of mine. I first met him when he came to Yegen to find out who is that Irish woman up here that keeps ordering his wines”.